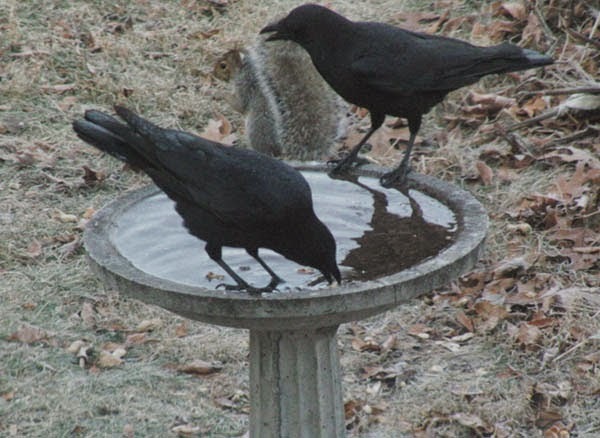 Everybody must have heard the story of the thirsty crow, who used it’s intelligence, started putting pebbles in the pot having very little water, making the water level to rise and finally quenched it’s thirst. Eventually it was just a story but scientists and researchers are trying to prove that crows are intelligent enough to utilize tools and remembering faces. Crows are considered as an intelligent species, they can survive in worsts situations, they are scavengers and can eat anything, certainly a plus point in the list of their surviving skills and this study on the crows proves that they are more intelligent than they are thought to be. Scientists considered that only primate animals have the ability of rational thinking, but according to the reports published in Science Daily, researchers have found out that crows can also think rationally. For study, two crows were trained to recognize the cards by color and then identify them, upon indentifying they would get reward as treats. Researchers at Lomonosov Moscow State University along with Ed Wasserman, professor of psychology at University of Iowa, explained how they trained the crows to match the images. The crows were further trained to identify cards by relationships and researchers noted that they could perform the identification of cards correctly and spontaneously. Anthony Wright, professor of neurobiology and anatomy at the university of Texas Houston Medical School said that “Analogical reasoning, matching relations to relations, has been considered to be among more higher order abstract reasoning processes”. He also added that “For years, such reasoning has been considered to be restricted to humans and some great apes”. The director of research at the University of Aix-marseille in France said that the results breaks the view that complicated forms of cognition can only be found in our smart human species. It was said that there is enough evidence to prove that animals can do more than it was anticipated before. Wasserman said that the experiment will be repeated on other species also.